As you see in my last post, we recently got a new cat in the household. Oreo has proven to be a pure delight to our family. I never thought I would own a cat but she is awesome. We have found that our camera and video recorder is filling up with some of the kooky things she does. You can see some of the photos over at my web album here. I was watching the World Cup on Sunday and caught this on video. I labeled the video Cat Reacts to the World Cup but my friend Jon had a better title. Cat Attacks the World Cup. I’m taking a trip for the second time this month. Today I fly off for Richmond, Virgina to visit my cousin, who lives in a “military” town outside of Richmond, for a few days. This will be the second year in a row that I have seen him, the most in over ten years. See, my cousin, 1st Sergeant Scott, is in the Marines and has served our country for over 15 years having been in the first Gulf War and made two tours in the second Gulf War; I’m very proud of him and grateful to him for his service. In between he has been bouncing around the east coast at different military bases and been in other countries, so he hasn’t had the luxury of being able to make Christmas visits to Grandma’s house too often for me to see him. But, now that he is back for good, for now, and settled in Virginia, I thought it would be neat to take the time to visit him and hang out while I’m still unemployed. He’s an avid golfer so hopefully we will be playing quite a bit of golf while I am there. I’m not sure what else there is to do in that area since I can’t see it as a tourist destination, which is actually a relief being that I live in a tourist town. Whatever is planned, I am sure it will be a good time hanging with my cuz. For my niece’s birthday, along with normal gifts, I decided to give her something unique that I am sure the grandparents or friends would not give her. 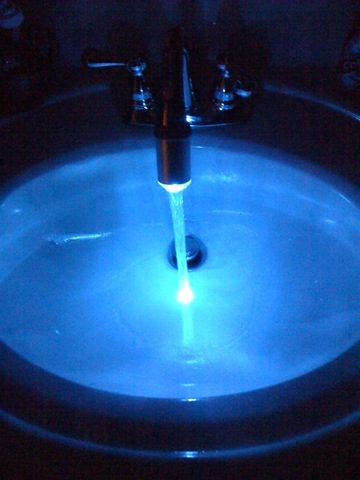 A LED faucet light from ThinkGeek.com. It’s blue when the water is cold. 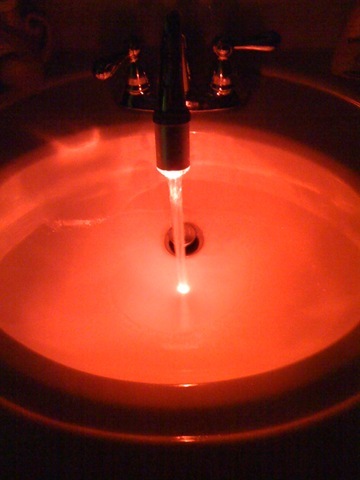 And red when the water is hot. I think she got a kick out of it. I know I did. 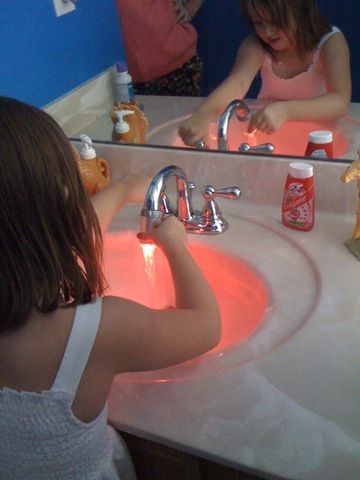 I may, eventually, buy one for myself to put in my bathroom. If you’re not familiar with ThinkGeek.com, check it out. They have some really cool stuff there. Plenty of unique gifts for friends and family to choose from. Last weekend, September 29th, my Dad turned 60 years young. My Mom, Sister, and I planned a surprise birthday party, it was mainly my Mom and Sister’s idea and planning so the credit is due to them, I just went along. It was a very nice weekend that involved deceit, laughter, cake, and a trip to the circus. Don’t think negatively when I state deceit was in our weekend. Everyone knows that when you plan a surprise you have to lie to the person who is being surprised. My Dad expected me to come up for the weekend for his birthday, since that is what I always do, but since we were planning on a suprise for him that involved other family members and friends of his, I had to tell him that I was not going to be up until Saturday morning in which I would meet my parents over at my Sister’s house because we were going to take the grandchildren swimming and then take my Dad out for lunch. The fact was I had actually planned on traveling up Friday night to spend the night at my Sister’s house so that I could help with the party and surprise. I had to tell my Dad that I had a late doctor’s appointment on Friday at the dentist office to follow-up after the root canal I had earlier in the week and I didn’t know what state I would be in to travel after so I told him I would travel up Saturday morning. I arrived at my Sister’s that evening and spent some quality time with her and my niece, Sierra, and nephew, Gage. I had bought Sierra an old iMac off of eBay a few months back but I hadn’t spent much time with her and the new gift when I bought it for her so that night I had her turn on the computer and show me what she could do. Being the computer geek that I am, that is the coolest thing in the world, to watch your 4 year niece navigate around a computer. I had also, earlier in the week, bought her a Scooby-Doo DVD (she LOVES Scooby-Doo) so we popped the DVD into her iMac and watched a few episodes together. Since Gage is just 8 months old, I can’t go outside and play football with him just yet but I still enjoyed sitting and watching him play with his toys. He is such a joy to watch. He hardly ever cries and is always happy and laughing. Pure joy. I just can’t wait until he gets the age we can go outside and toss the football. The surprise for my Dad was relatively a success even though I was surprised too. I had taken my camera to snap some pictures and, most importantly, video record his arrival and surprise but my Mom did not keep us updated so we didn’t know when exactly he was going to arrive. By the time he walked into the recreation building where we were having the surprise party for him, I didn’t have my camera ready to record the surprise; But he was surprised. After the party, the immediate family (my parents, my sister, her husband and the children) spent most of the afternoon at Denise’s house watching football and spending time with the kids until the circus that evening, which was another surprise for the day. My Mom had bought some tickets for the Shriner’s Circus at Univeristy of North Florida in Jacksonville for the whole family and wanted it to be a surprise for Sierra since she had never been to the circus before. We told Sierra that we were going somewhere that evening but didn’t tell her it was the circus. When we arrived there I don’t think she actually realized what was truly going on until it started and the clowns and performers started coming out. She had a blast, and, I believe, all of us adults had more of a blast watching her enjoy the circus. It truly was a lot of fun. My Dad’s day was really a good day for the whole family. The entire weekend was a lot of fun. I am truly blessed to have such a wonderful family. I guess now is when we have to start getting into the habit of stating that my Dad is “insert age” years young now instead of old. That’s what most of state to respect the Senior Citizens, huh?